/ Modified may 10, 2018 9:15 p.m.
Gov. Ducey: TUSD's Plan for Staff Raises "Disappointing"
Arizona Gov. 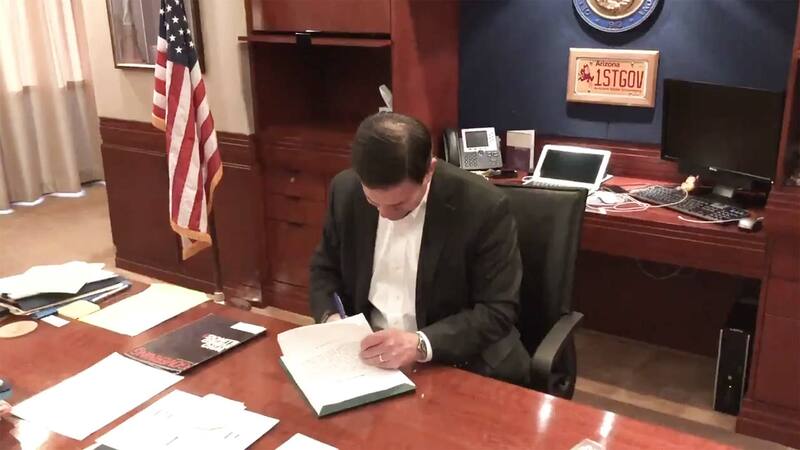 Doug Ducey signs a bill early in the morning of May 2, 2018, putting 19 percent teacher raises into the Arizona budget over the following three school years. Arizona Gov. Doug Ducey said Thursday he does not approve of Tucson Unified School District Superintendent Gabriel Trujillo's plan to use a portion of new money meant for teacher raises to increase the wages of all school staff. "It's disappointing that that's how [Trujillo] sees that because these raises were passed for our teachers," said the governor. Ducey spoke on the matter while attending a ribbon-cutting event at Raytheon Missile System's Tucson campus. "Tucson Unified School District is going to see over $21 million new dollars in this education cycle. Those dollars are to get to our teachers, and there's dollars through additional assistance, inflation and other funds that can get to support staff," Ducey said. The recently-passed state budget for the fiscal year that begins in July gave school districts money for a 9 percent raise for teachers. Raises for both teachers and support staff were among the teacher's demands during a statewide walkout that closed schools last month.